In spite of complete paper processing machinery and custom-made paper making solutions, Leizhan also provide single paper machine and spare parts for paper mill for fast delivery. Rewinder machine is used for slitting, rewinding high grade kraft liner/testliner board paper to meet the requirements of the width and tightness of the finished roll. 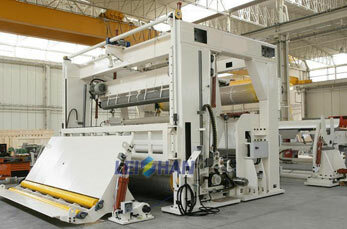 Leizhan high speed overfeed rewinder consists of unreeling stand device, guide roller unit, curved roller device, the bottom round knife device, upper round knife device, constant tension sensing device, the upper and lower sheet transfer device, support roller device, main frame device, deputy rack device, gear, rolls tight device, press paper device, pushing paper device, unloading paper device, paper suction fan unit, electricity, gas, liquid control system. Leizhan high grade rewinder machinery can improve the efficiency of kraft paper machinery and the quality of finished paper roll. With 34 years experience in paper making industry, Leizhan is capable to provide extensive paper machinery for paper mill.